I’ve recently had my birthday and as a gift decided to give myself a NUC. The intention here is that I could replace the old laptop running Jenkins and Grafana with something that’s a bit more silent and in a smaller form factor. Note that I’m not affiliated with any of the hardware manufacturers in any way shape or form. The laptop I’ve been using for Jenkins has become rather critical for this blog and a few side projects I’ve got. This meant that I first needed to find a way to migrate everything to a new machine that would be coming. I’ve then focused on rewriting my infra to code with the help of Ansible®. Even though I’m not a super big fan of it I’ve managed to write everything as an Ansible playbook. I did, however, skip the Jenkins and moved towards Drone CI instead. With this complete, I needed to figure out what type of a machine I might want to go for. I did a bit of digging and a NUC seemed a perfect candidate for the form factor I was looking for. 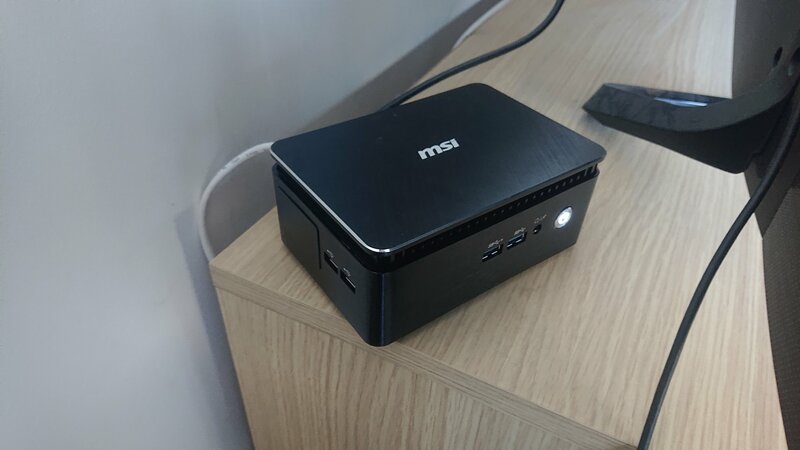 There seem to be a only a few passively cooled ones but once I found the MSI Cubi 3 Silent S I looked no further. It seemed to tick all the boxes, with support for an M.2 SSD as well. For a grand total of 499.98€. After waiting for nearly a week for my Cubi to arrive, I’ve started assembling it. The NUC is quality made. The aluminum looks top notch, there’s plenty of soft-padding inside for all the components as to avoid any rattles and weird noises. The NUC is pretty heavy - an indicator for plenty of cooling present. Assembling everything was a breeze, but then I hit an issue. The issue that I’ve struggled with for a while. The M.2 SSD was not detected by bios. I did some investigation on the internet, found that it’s a common issue and that the OS setup would usually find the SSD. This did not work for me however. I’ve tried Ubuntu, CentOS and Windows setups but none managed to detect the drive. I’ve no idea if it’s the cubi that’s faulty or the drive. I had to fallback to an old ssd I had on hand to install the CentOS on it. I’ve spent a good few hours playing with the BIOS, plugging and unplugging the drive but did not manage to get it to work. Since I don’t have any other device with an M.2 slot I’m unable to test the drive in isolation. I’ve given up on it already but if you do have pointers for what I should try - do leave a comment. Despite this - I can’t blame the Cubi - it does seem like a good product. Once the OS was installed, I ran my prepared Ansible playbook to set up everything I need on it. This was rather painless despite me not being a fan. Hats off Ansible, you win this time. So the Cubi outdoes the MacBook. I really think if I were to leave the mac alone it would perform the build a tad quicker, but the Cubi seems to be doing well for the price. As far as the temperatures go, the Cubi’s CPU sits at 41°C on idle. While chewing on something a bit heavier it goes to around 55°C(I used stress to test this). I did not run it for hours though, so numbers might not represent a true stress test. I’m pretty happy with the way the Cubi performs. Since I’m not going to be pushing it 24/7 it seems to be appropriate for my use case. I’m sure there are alternatives that might be a tad cheaper but since I keep it in the living room the aesthetics are also a consideration. It’s a quality product that will hopefully last for a long time and be the host of many of my hobby projects. Maybe I should have opted for something else rather than the Cubi? Any projects I should try to put on it?